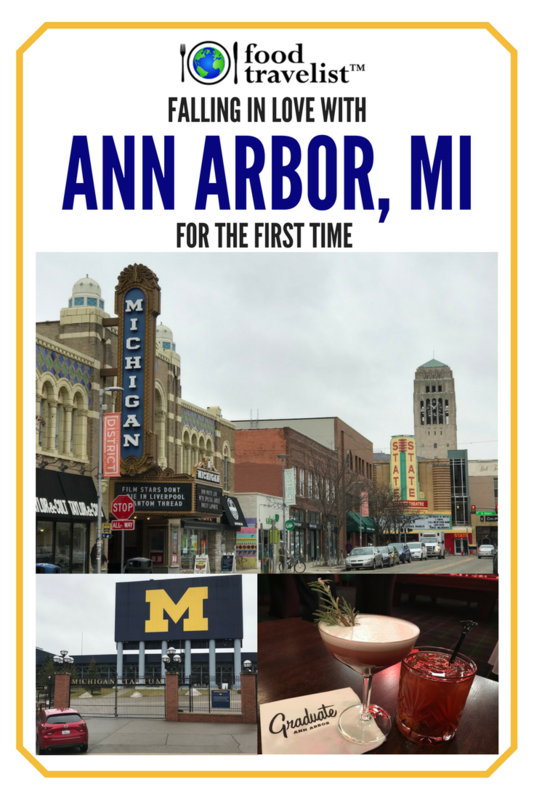 I wrote this post after our media trip that was hosted by Visit Ann Arbor and The Graduate Hotels. All suggestions and endorsements are solely personal. Our policy is to only share and recommend what we personally like and experience. For this road trip, we drove a Mazda CX-5 loaned to us from DriveShop. In the Midwest, we’re lucky to have so many different places to explore by road trips. It’s easy to jump in a car and in just a few hours be somewhere that you’ve never experienced before. 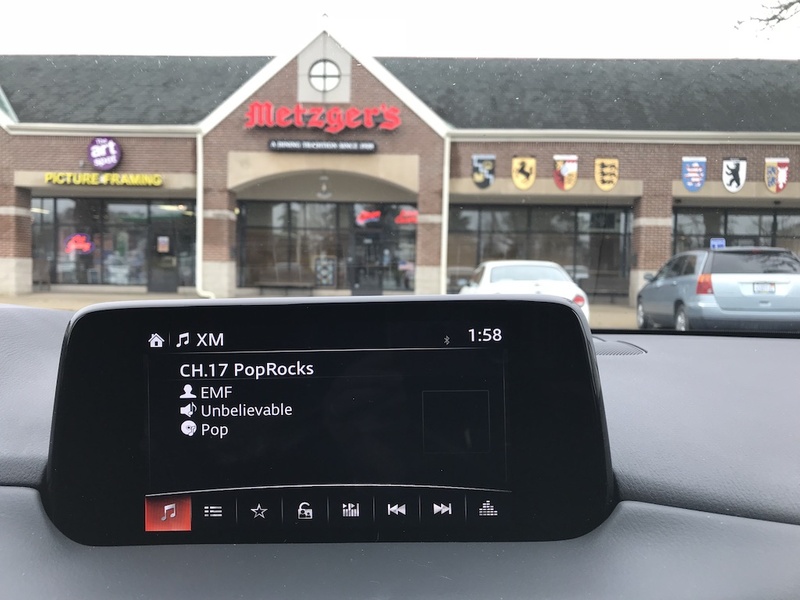 This was the case when we jumped into our 2018 Mazda CX-5 that we were test driving for the weekend and headed to Ann Arbor, Michigan. 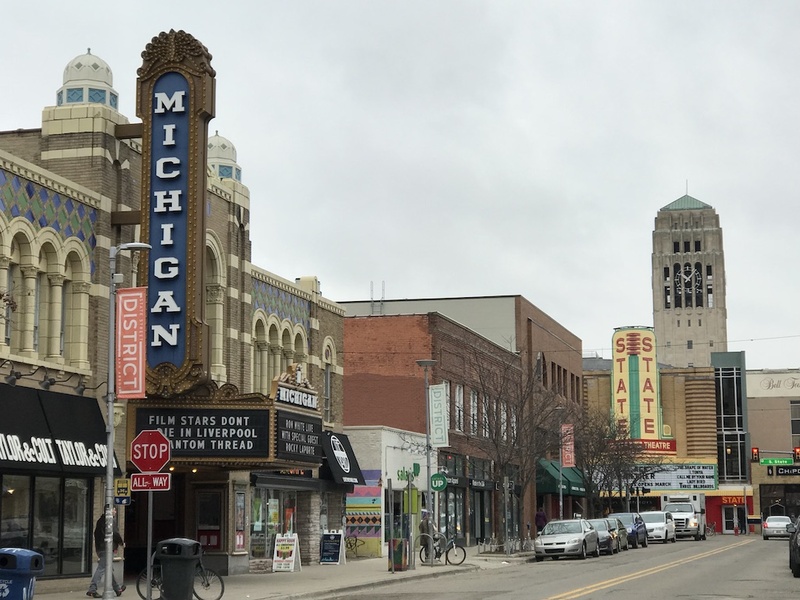 Just about 4 hours from Chicago and less than an hour from Detroit, Ann Arbor is an excellent road trip length. The Mazda CX-5 is described as a compact sports utility vehicle. We thought it was perfectly sized for us. There was more than enough room for our luggage and goodies on the return home and it was fun and sporty to drive. The Mazda CX-5 has all the latest safety and communications technology features to keep even the most strident car enthusiasts happy. 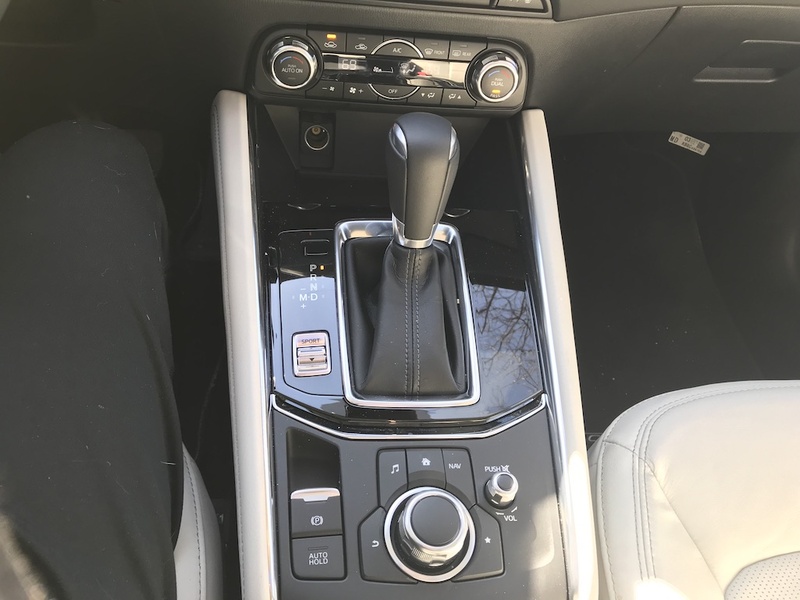 We really liked the easy to reach Mazda CONNECT™, the control knob is in the center between the front seats. This Commander Control makes it simple and safe to access your audio, navigation and app settings. The Active Driving display is more robust than others we’ve seen. It shows the speed limit, the speed you’re going and notifies you of stop signs and the street names which is super helpful while visiting new locations. Mazda Active Driving Display. Photo Courtesy of Mazda USA. Many people know Ann Arbor, or A2, as home to the University of Michigan. In addition to excellent academics, the Big Ten school is well-known for its athletic programs and their loyal fans. 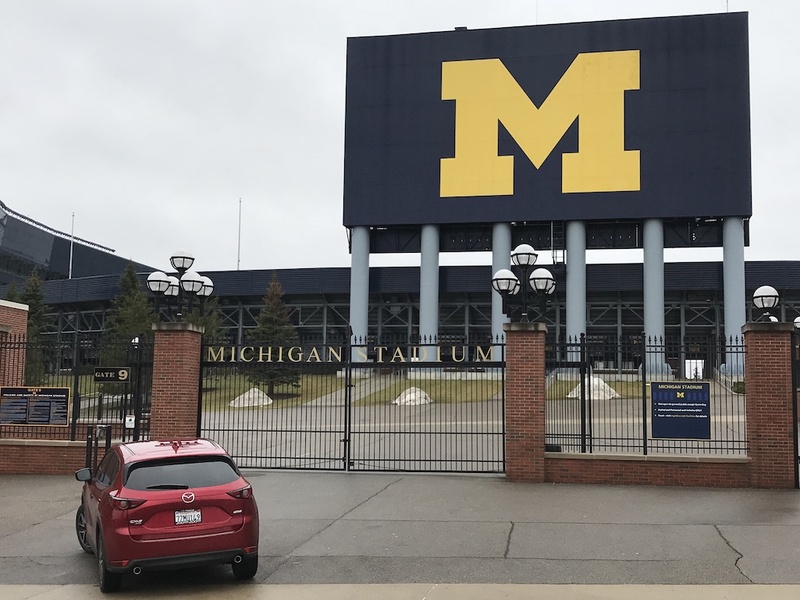 You will want to take a look at “The Big House,” which is said to be one of biggest football-only stadiums in the world and the largest in the U.S. Holding over 100,000 Wolverine fans this place is a must for any college football fan. Plan to get tickets way in advance if you want to catch a game, especially if you want to see Michigan play one of their long-running rivals like Notre Dame or the Ohio State. Michigan is far more than an athletic school. Michigan is also a top-ranked research school. Just some of its notables include 24 Nobel prize winners, 6 Touring awards and 1 Fields medalist. 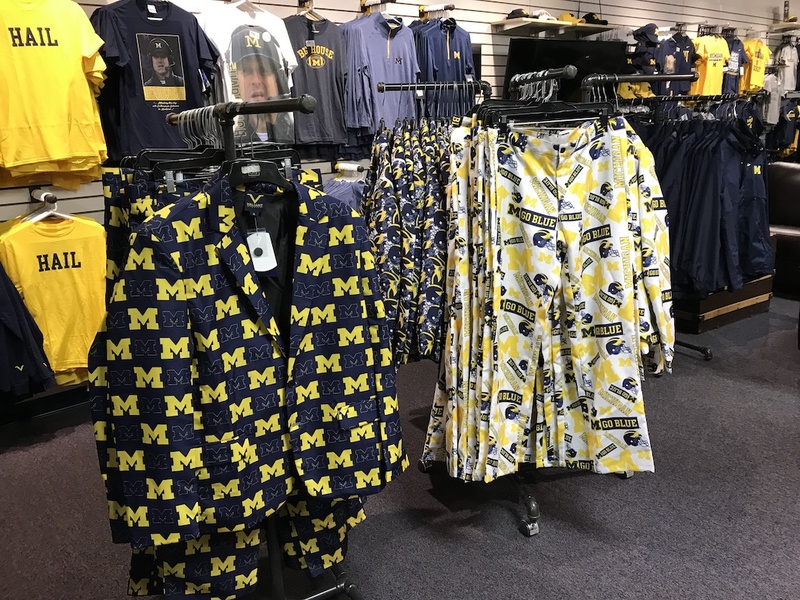 Needless to say, Ann Arbor is proud of its university and a visit there must include a stroll around the beautiful campus and its museums and art galleries. We were excited to stay at the Graduate Hotel in Ann Arbor. 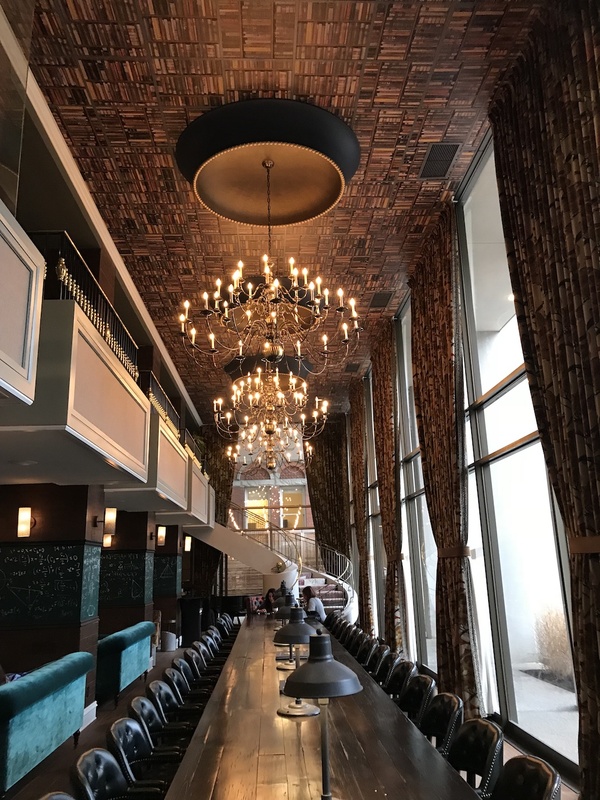 We had stayed at the Graduate Hotel in Madison on a recent visit and really enjoyed it so we knew we were in for a special treat. One of the things that makes the Graduate Hotels so unique is that every hotel is designed to reflect the college it’s near. Entering our room we knew right away that we were in Michigan country. 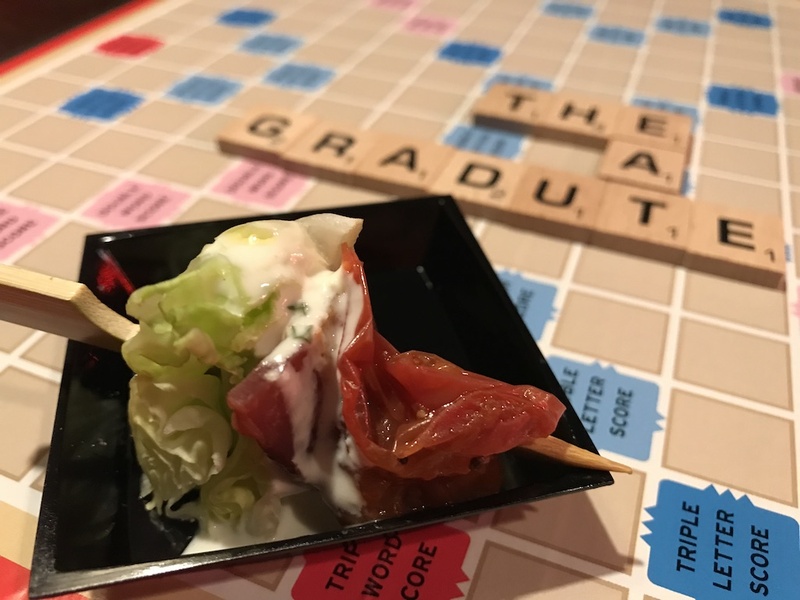 While the hotel in Madison was fun and campy rustic and Midwestern, the Graduate in Ann Arbor had an air of distinction and honor befitting the Michigan campus located just steps away. 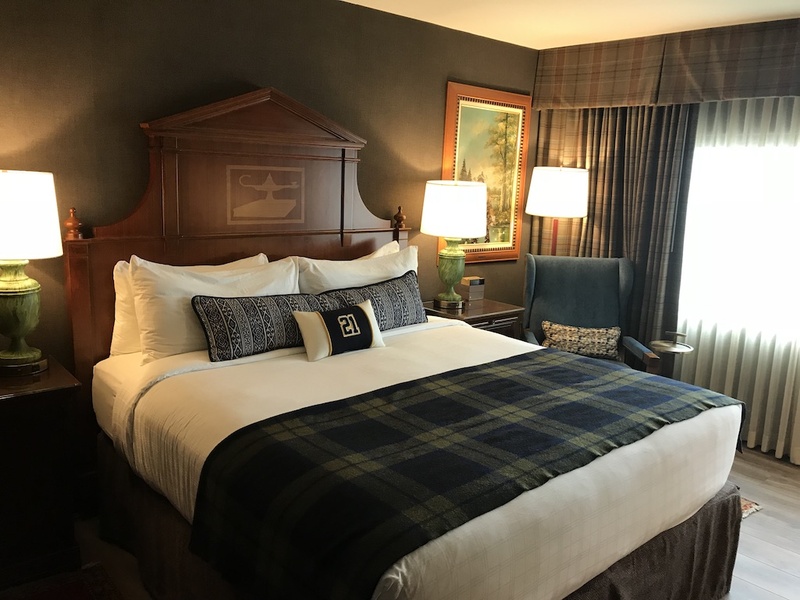 Clubby dark wood paired with a blue and maize color scheme run throughout the hotel decor. The hotel lobby features a long communal table that students and guests use for meetings and gatherings. The ceiling is covered with a library book wallpaper well lit by the elaborate chandeliers. It’s comfortable yet elegant at the same time. There is also a grab and go counter in the lobby for freshly made local pastries, including some local standout Zingerman’s (more on them later) coffee and sandwiches. It’s perfect for a quick breakfast or snack. 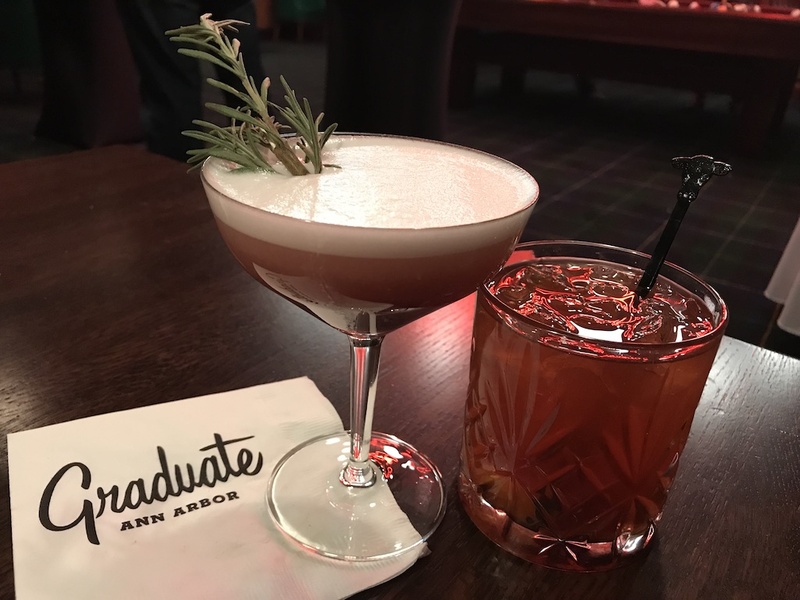 We were lucky to been staying at the Graduate when they were reopening their hotel restaurant. The former Allen Rumsey Supper Club was converting to the Allen Ramsey Cocktail Lounge. We were among the first to taste the new menu items and cocktail creations. We love when restaurants have a lot of local spirits, wines and craft beers on their beverage menu. The Graduate really does an outstanding job on their list. We can highly recommend the Mrs. Robinson, featuring local Arbor Wheat Vodka, lime, raspberry simple syrup, creme de mure, Peychaud’s Bitters and egg white. Of course, we also had to try their delicious Old Fashioned, which we also loved. The new cocktail lounge features wonderful appetizers, sandwiches and salads. We were quite taken with the quality of the food being served. We tried bites of the Allen Rumsey Wedge with crispy bacon, blue cheese, and roasted cherry tomatoes. The flavors were perfectly paired. 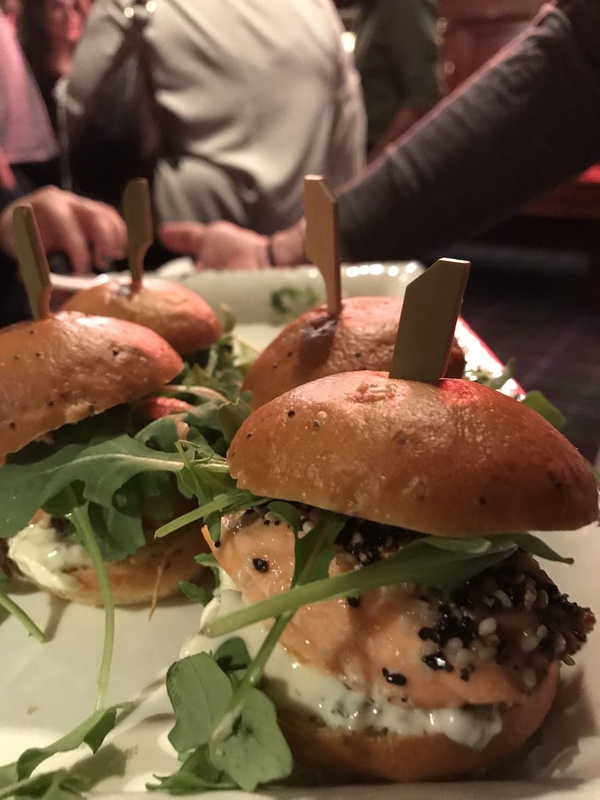 The “Everything Bagel” Crusted Salmon Sandwich was unique and equally delicious. The local grass-fed steakhouse burger on a Zingerman’s paisano roll with red onion au jus and horseradish sauce was also a favorite. The side of beer battered onion rings was a perfect accompaniment. They were so lightly breaded and crispy we couldn’t stop eating them! Their menu also includes jumbo shrimp cocktail, cheese and meat boards, avocado toast and more. All great for snacking, a full meal or sharing. Classic board games like Scrabble, Risk as well as Battleship and a life-sized Connect Four are available to pass the time with friends. 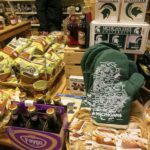 You might not expect to find many culinary delights in Ann Arbor because it is a college town. You would be dead wrong. The school attracts students from around the world creating a multicultural community. This open and welcoming city has food from just about every corner of the world. Whether you’re seeking Italian, Korean, Moroccan, Polish or German, they have it. Vegetarians and carnivores alike will find foods to please the palate. 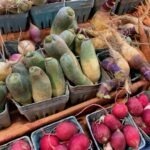 Local breweries, cheese makers, bakers and a weekly farmers market will keep you busy during your visit. The hardest decisions we had were how many could we experience on our weekend visit. We rose to the occasion, donned our stretchy pants and got to eating. 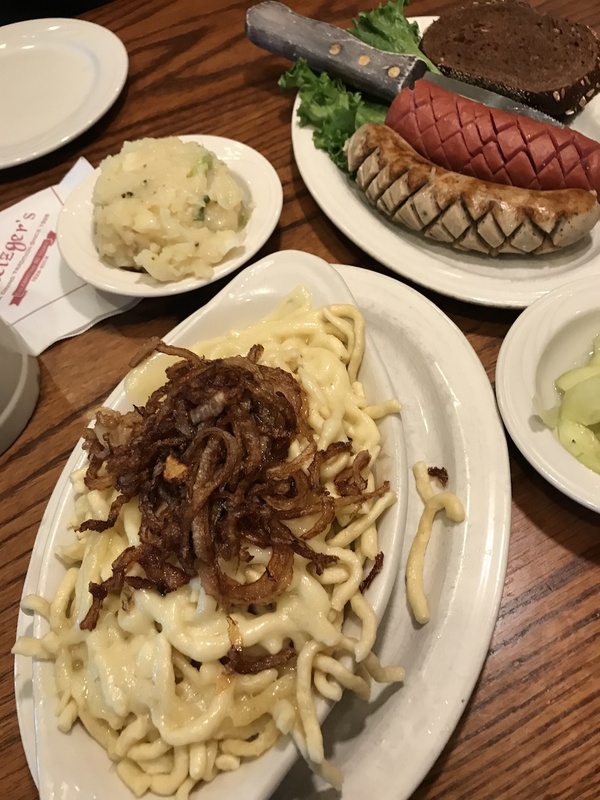 We just can’t say no to a great German restaurant. When we heard about Metzger’s we had to try it. Don’t be fooled by this strip mall storefront. They are cooking up some delicious and authentic Bavarian food. Be sure to try their unique version of käsespätzle. Homemade noodle dumplings with crispy grilled onions covered with Swiss cheese on a bed a sauerkraut. Lots of German beer and wine to choose from make this spot just perfect. 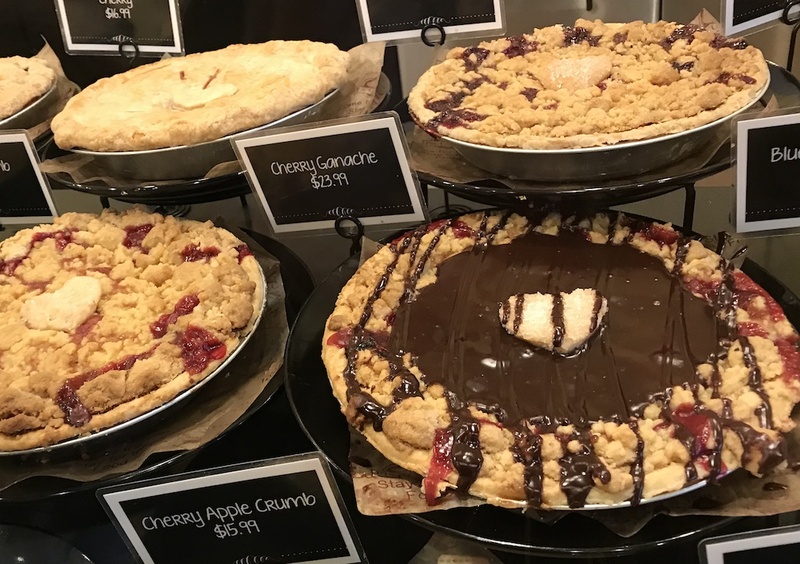 While you’re at Metzger’s leave a little room for dessert because just a few doors down is the Grand Traverse Pie Company. We fell in love with their pie on a visit to Traverse City, Michigan. They have a full selection (over 40 to choose from) but they are well-known for their collection of cherry pies. We tried a new one for us, the Cherry Ganache, a cherry crumb pie topped with decadent homemade chocolate ganache. Don’t forget to get a scoop of ice cream on top! 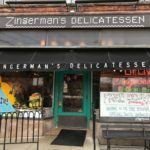 If you go to Ann Arbor and miss Zingerman’s Deli you will have missed something really special. They’ve created a deli and so much more. Their famous customer service is so successful that they now teach other small businesses how to survive and thrive. 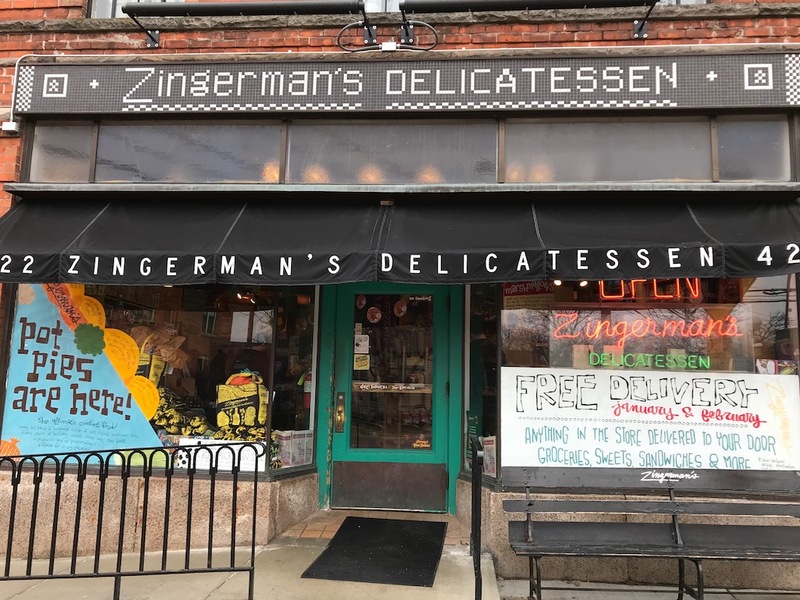 There is so much to cover on Zingerman’s from the deli, to their coffee house, candy shop, cheese shop and their commitment to community service that we’ll write a separate post on them very soon. If you’re looking for a brunch in Ann Arbor go no further than the Aut Bar. They serve their Mexican Brunch on Saturday and Sunday and you’ll find many hearty choices. This spot serves the gay community but everyone is welcome. It’s a vibrant and happy crowd that meets here on the weekend. We loved our food! 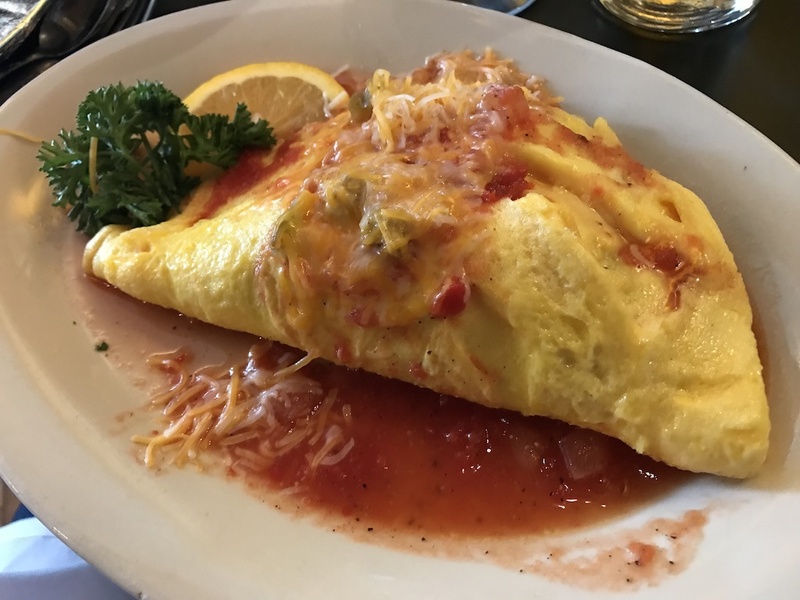 My Sonora omelet was huge and loaded with seasoned chicken, guacamole and sour cream. Topped with a ranchero sauce and cheese, it’s served along with tortillas, rice and beans. The cocktails are also fun but we chose their take on a classic brunch drink, a Bloody Mary. It came adorned with bacon, olives, cucumber and peppers. Yum! 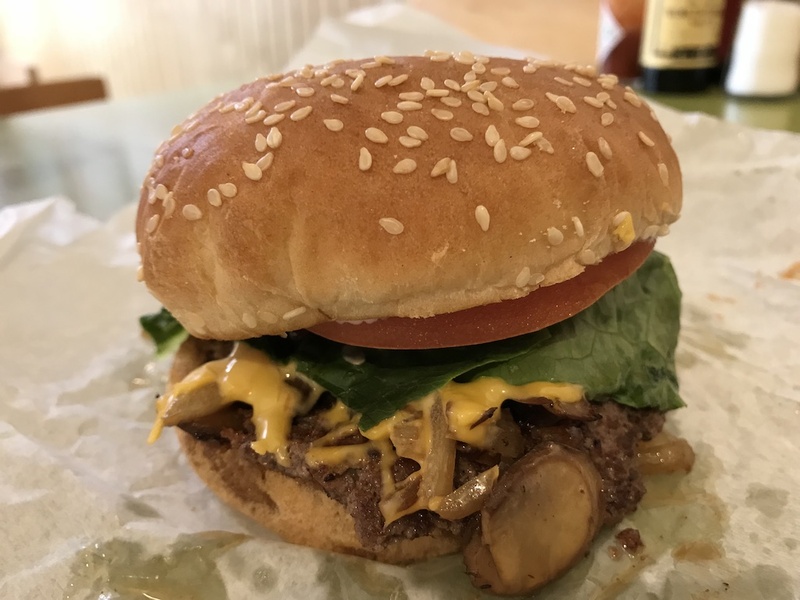 If you’re looking for something quick and cheesy check out Krazy Jim’s Blimpy Burger. The oldest hamburger joint in Ann Arbor, it’s been around since 1953. The burger is a typical thin patty crisped up on a flattop. The experience is one of kind. Be prepared to wait in a line (moves fast). Order only when you are directed to and not before. Let’s just say customer service is not their priority. They have other sandwiches and sides to choose from, too. But their double burger (only kids can order a single) is what keeps them on the map. This is just a very small sampling of the great eats you discover in Ann Arbor. Here are a few more to check out! Slurping Turtle if you know this spot in Chicago- it’s the same one. With its own twist on Japanese ramen, they encourage guests to slurp away on their unique creations. The Earle is known for their French-Italian food another great place to relax and enjoy. Live jazz on selected nights too! One of the most charming things about Ann Arbor is its downtown area. You will find classic movie theaters, restaurants, coffee shops and more. It’s got a friendly small town Midwestern vibe, yet is chock full of great specialty stores to explore. One of our favorite things to do while traveling is to walk. We love strolling around and finding little shops and streets that have many features to explore. We love that Ann Arbor has a ton of these streets throughout their neighborhoods. Downtown is especially rich in locally owned shops that can provide hours of discovery. We really loved the Found Store (it’s where I added to my magnet collection!) and the Himalayan Bazaar, where we spent way too much time, to Rock Paper Scissors, which had clever gifts for everyone on our list, especially our young little niece. 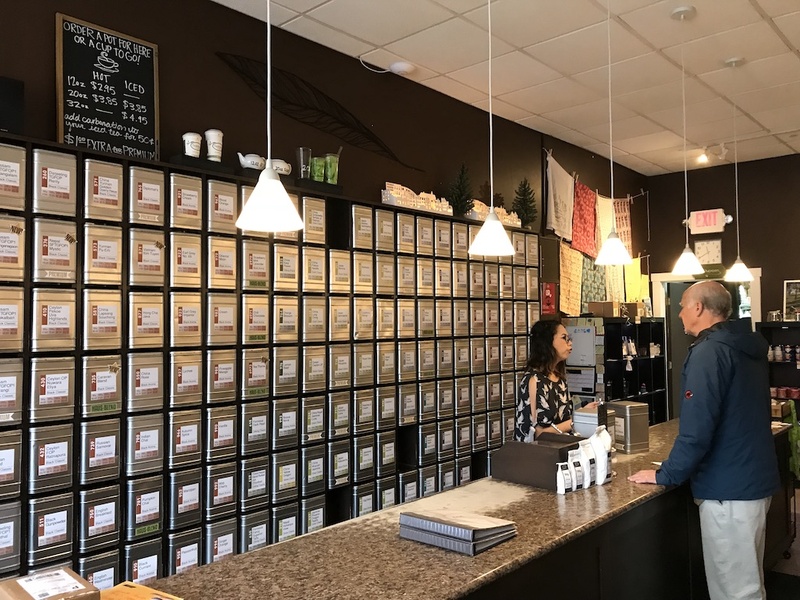 In between eating, shopping and exploring, stop into the Tea Haus. If you’re a tea lover like me your head will be spinning from the wall of tea choices you’ll see as you walk in. If you want a more relaxed experience, opt for an afternoon tea in their tea room with a friend. It’s a perfect spot to settle down, catch your breath and enjoy great tea and company. 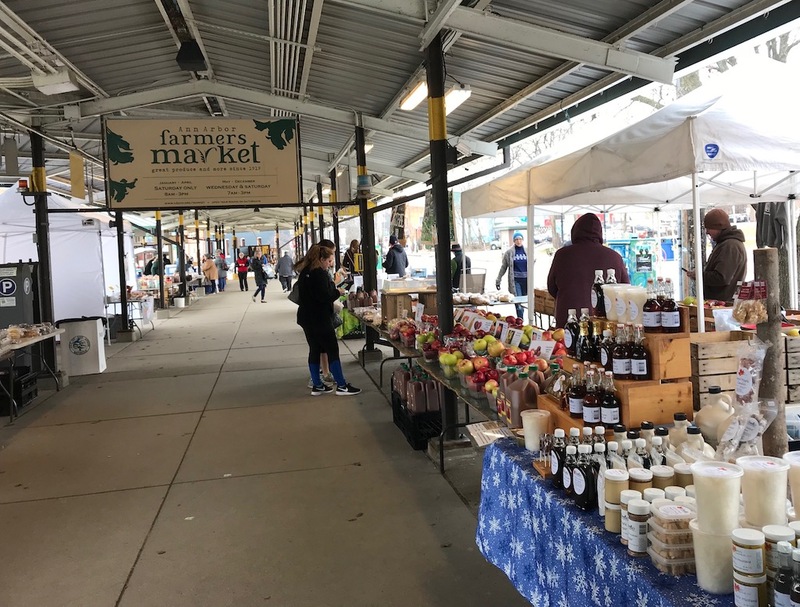 While we could go on and on about the food and shops in Ann Arbor, we have to share all the other things that make this a perfect road trip destination. If you clamor for art, you will find museums and galleries at the university and in town. The Ann Arbor Hands-On Museum provides over 250 interactive science and technology exhibits to enjoy. 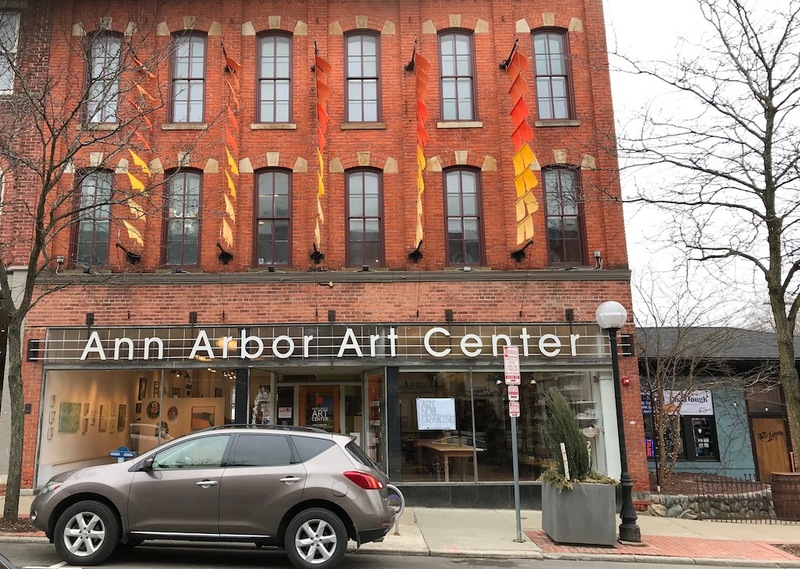 Galleries and classes can be had at the Ann Arbor Art Center located downtown. One of the more unique museums is the University of Michigan Sindecuse Museum of Dentistry. It houses more than 18,000 artifacts on display going back to the 1700s. The look back at how women helped shaped dentistry is well worth exploring. If you’re a history buff you’ll want to check out the Gerald R. Ford Presidential Library on U of M’s North Campus. For more outdoor adventures you can explore the Matthaei Botanical Gardens, Bird Hills Nature Area and many nearby parks and rivers. If you have a bit more time on your trip, go and visit the smaller towns around Ann Arbor. Ypsilanti and Chelsea are worth a look around. We have a particular fondness for Ypsilanti or Ypsi for short. It’s named after Demetrios Ypsilanti a hero in the Greek War of Independence (you can even see a statue of him in town). That’s where Diana’s Mom Nancy grew up. We had a great time driving down Nancy’s old street, telling her what it looked like now and sharing photos of her childhood home. 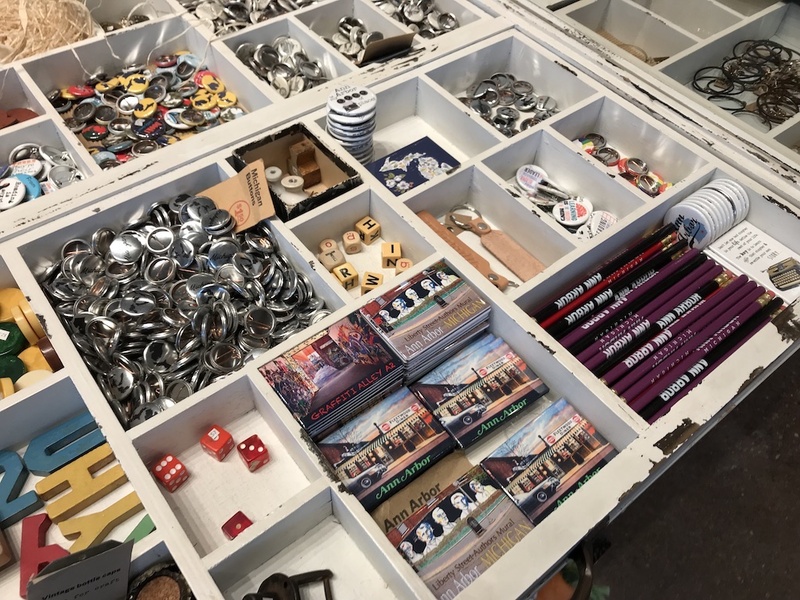 Ypsi has plenty of interesting shops to explore on the main streets of Downtown (don’t miss The Rocket for fun gift ideas) and in the Depot Town district. 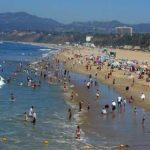 There are also lots of festivals and activities to enjoy all year round. 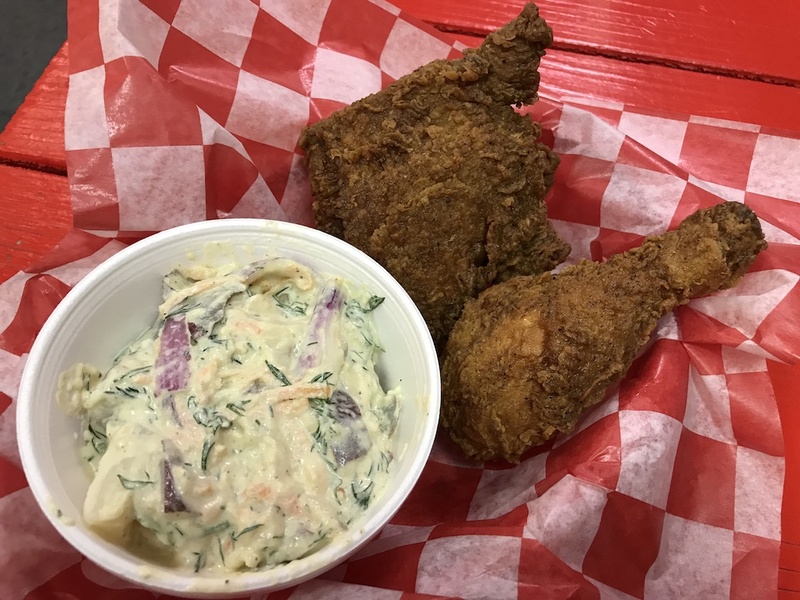 We went to the locally recommended Ma Lou’s for some of the best fried chicken we’ve ever had. 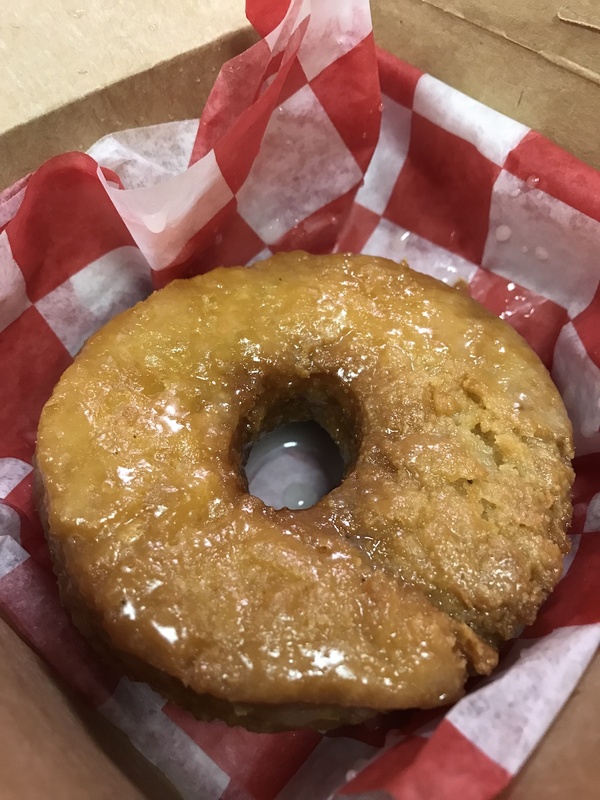 If you go, don’t miss the biscuit donut. Yes, it’s biscuit dough given the donut treatment, sweet, crispy, chewy, mmmm – it’s ridiculously good! Chelsea is a smaller historic town about 15 minutes from Ann Arbor. Also home to two local breweries and a downtown suitable for walking and checking out all the shops and architecture. They have a strong agritourism culture including local farms and farmers markets. Chelsea is also the home of Jiffy Mix. You can even reserve a free one hour tour of the packaging plant. If you like outdoor fun don’t miss the Waterloo Recreation Area. It’s a 20 thousand acre park to explore. Hike, bike, fish or ski it’s perfect for any time of year. Chelsea native, actor Jeff Daniels, founded The Purple Rose Theatre Company there too. Even spending such a short time in Ann Arbor we really got a great taste of all there is to do. Clearly, we could have stayed a lot longer. There’s just so much to enjoy! Ann Arbor, Michigan is a wonderful destination no matter how you get there. And for a quick road trip or a longer one, you’ll have more than enough to eat, see, discover and do to keep you coming back. For more information on how to plan a trip to Ann Arbor check out VisitAnnArbor.org for all the details. Pin It for your travel planning to Ann Arbor. Looks like this was a great/successful trip. The hotel where you stayed is beautiful. I’ve never been to Ann Arbor but in high school many moons ago, I believe many of the music students went there to compete with a bunch of other musically talented folk. Looks like you guys had a great time! I’d love to try out that car, I love the screen to help drivers. I haven’t been to Ann Arbor, but it would make for a fun road trip. It sounds like you had the ultimate road trip to Ann Arbor. I haven’t made it that far North in Michigan but it sounds like fun, even for someone who doesn’t cheer for the Wolverines like me! Michigan has so much to offer. I have traveled through the state several times, but I admit, never to Ann Arbor. Might make it a must-see next time I am in Michigan!! What a super nice vehicle to take a road trip in. I would have to agree, a 4-hour trip is right around the perfect length for a trip. Ann Arbor looks like the perfect destination for a road trip. So many sights and experiences to savour. I was fascinated by the picture of the Lobby at the Graduate Hotel, I refer to the long community table, it looks so unique. It’s such a beautiful and fun place! I think I’m going to have a lovely time here especially since there’s so much to enjoy. The food looks great too! I’ve never been to Michigan but have always wanted to visit. It looks like such a fun place with a lot of culture rooted in the college. I’ll have to get there one day. That bagel salmon looks super delicious! That is one place I would love to explore, just beautiful! Its kind of the same here in northern Colorado. We could go to four different states within just a few hours drive. The Graduate looks like a fabulous hotel. I want to visit Michigan now! Love all the yummy food you had too. I would fall in love with the food in Ann Arbor, it all looks sooooo good! We love to take weekend trips, and this would be a really doable road trip for us. Thanks for the tips and ideas! All of the food looks so yummy! It looks like the perfect time exploring. Love the Mazda. It’s such a great car! I have never stopped in Ann Arbor but I’ve driven past it on our way to Detroit a couple of times. I never realized there was so much to see and do there. WOW! I am driving to that city many, many times that I’ve never stopped. Apparently I need to because there’s a lot of great places to explore. That food looks mouthwatering. I love the Mazda CX-5! 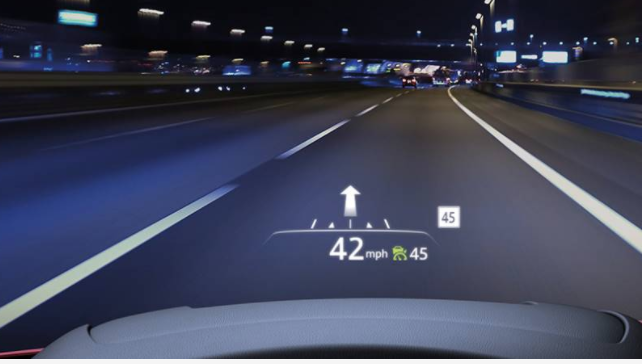 The Active Driving Display is an awesome feature! They sure come packed with a lot of goodies and safety features! Ann Arbor sounds like a great place to visit! I have to say that I love finding cute little deli’s when we travel. Glad to see one in your list. I’ve always wanted to visit here but have not had the opportunity yet. I need to move it up higher on my bucket list after seeing all of your photos. Ann Arbor sounds like an amazing place! We actually have friends that moved out that way and really love it. That food looks delicious and worth a trip just for that! Michigan does look beautiful! We use to live close to Ann Arbor and visited often. Go Blue! Tons of things to enjoy and the food is always wonderful. I like the vehicle! It looks comfy. I’ve never been to Ann Arbor before but after seeing all these photos, I feel like I MUST go. I lived in Lansing for a time years ago but not sure I ever made it to Ann Arbor. The crusty salmon sandwich would be right up my alley, food-wise, and it looks like there are lots of good choices there! Next time we head up to Michigan, I’ll make it a stop! Haven’t been but Ann Arbor sounds so inviting. Good you got a red Mazda…so attractive. 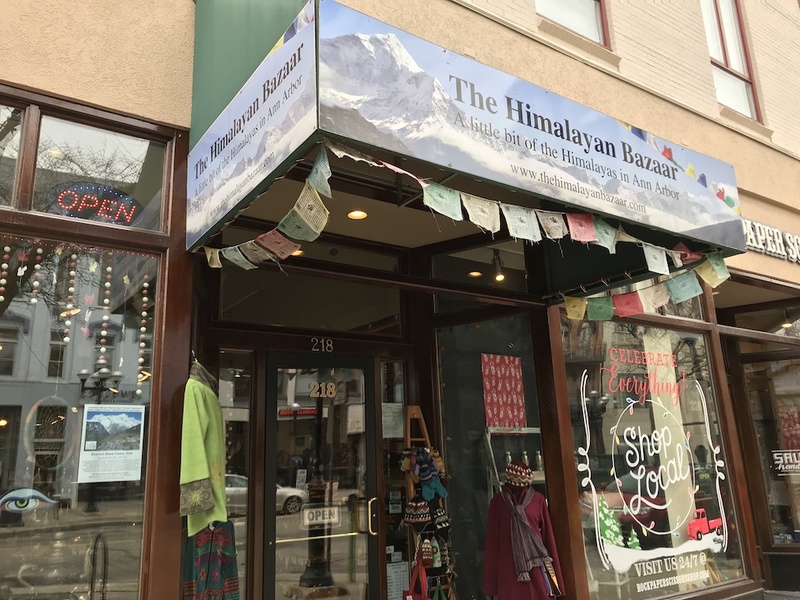 Would love to walk the Farmers Market, the Arts Center and the Himalayan Bazaar. I’ve not yet been to Ann Arbor, so your post was intriguing to me. I’d love to visit the Art Centre and the Himalayan Bazaar. My cousin went to the University of Michigan and i remember visiting him and just loving the whole city. The food was delicious and the locals were very welcoming. Can’t wait to go back. Ann Arbor looks like a great place for a vacation. The salmon on the bagel sold me. Your food photos are mouthwatering. 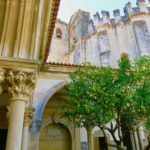 I think there are so many beautiful and fun places to visit in the USA that sometimes we forget about. I went to Minneapolis to visit my daughter who moved there recently and was impressed with how that city has changed too. Such a good food scene like Ann Arbor. That does look like a fun place to visit. I love the idea of visiting a new place and this one looks like a great place to check out. My cousin lives out that way and I have yet to visit him but this really makes me want to head out and see him. Ann Arbor looks like such a beautiful city to explore. I have never been. 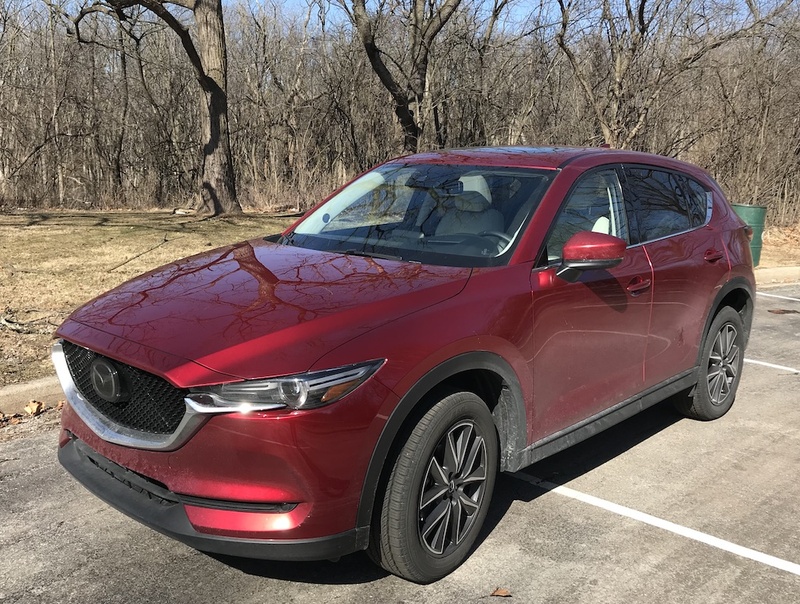 I have test drove the CX5 a few times and I just LOVE it. It drives SO beautifully! Wow! We have only made a quick stop in Ann Arbor a few years back, and never realized just how much is there. It looks like we will need to return, so that we can also fall in love with Ann Arbor. Thanks for sharing.